The Hidden Glasgow Forums • View topic - Hamilton Question. came across this in Low Waters in Hamilton the other day, it attached to a pretty bog standard set of housing. 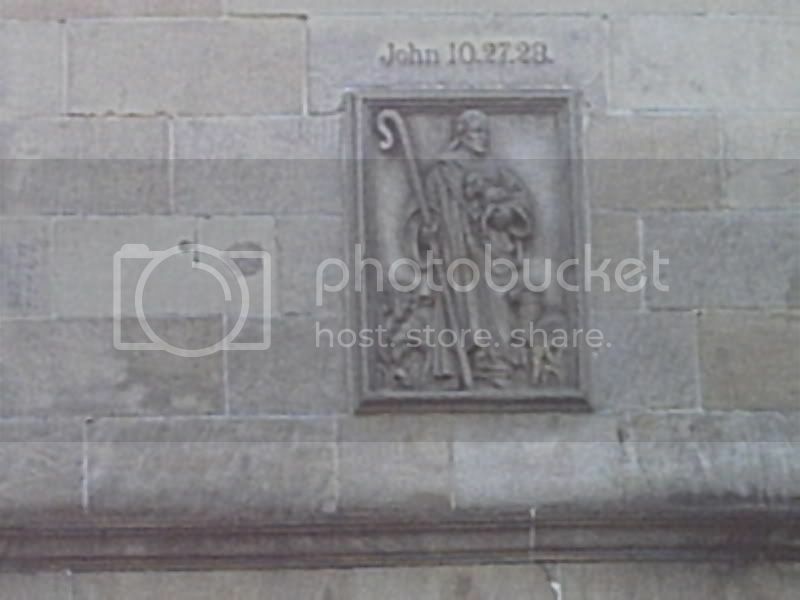 Place where a church was once? Ive asked around including the present peeps who live in the close, and they don't seem to know it's background. I know a few folk that might know, can you tell me where it is? "John 10, chapter 27, verse 28" - its from the bible methinx. I'd check it but can't find our bible at the moment. Doc, its about halfway up Low Waters Road. Its obvious that a good Baillieston education has shown through here Apollo ! DickyHart wrote: Doc, its about halfway up Low Waters Road. I'll ask tonight and report back. and I have no idea at all!! Only thing I can think is that the tenements on that side of the street (west?) were probably built to house the large influx of people to Hamilton due to coal mining when it changed from a rural town with palace and a burgeoning industry of private schools and lace makers to an urban mining town which it's never recovered/adjusted from. 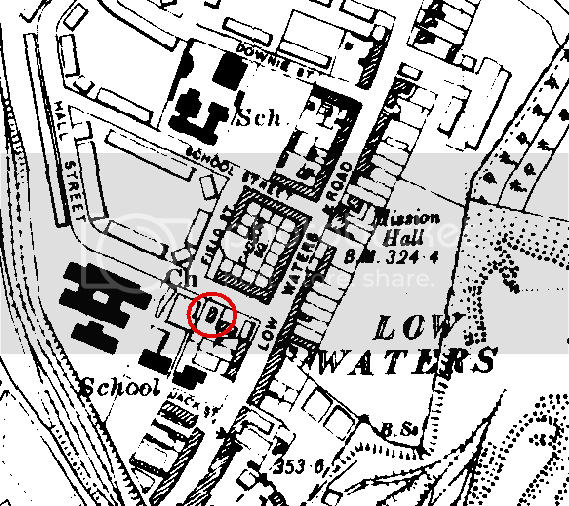 Low waters was a seperate village before this expansion and the gate or port to Hamilton would have been between the Barleycorn pub and the roundabout at the bottom of the hill. 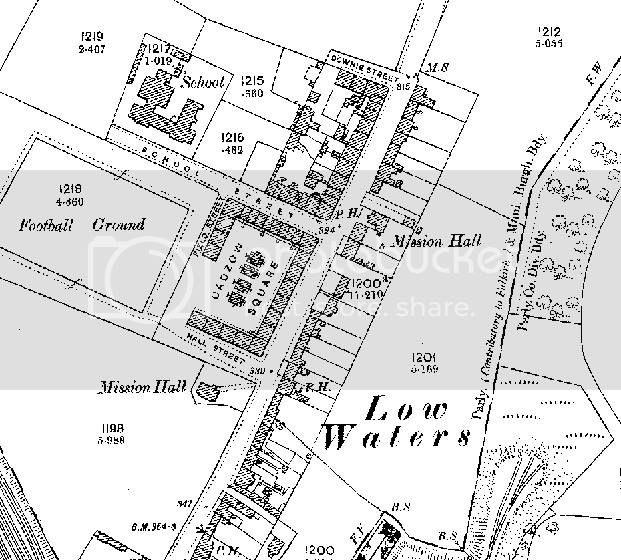 Low Waters was a village in its own right until it was incorporated into the burgh in 1878, when it would have been nothing more than a row of houses. In 1862 Cadzow Colliery was sunk there, and at eight hundred feet was thought to be one of the deepest pits in the Clyde Valley. It was owned by the Cadzow Coal Company who reputedly had Keir Hardie as an employee at one point - although other mines have made similar claims. Giving evidence at the trial if the notorious Jessie McLachlan in 1862 one of the witnesses had this to say "Low Waters is not a large village. It is a row of houses 200 or 300 yards along the roadside". In 1831 there had been 9,513 people living in the parish, by 1881 there were 26,231. This explosion of the town, involving as it did massive immigration of thousands of people from all over Scotland, Ireland and England put an immense strain on existing amenities of Hamilton such as houses, streets, water supply, sanitation, education, poor relief and the maintenance of law and order. The town spread out to absorb surrounding villages like Burnbank, Low Waters and Ferniegair. The characteristic miners rows appeared near most of the collieries hurriedly built to house the hurriedly recruited labour force. The railway came to Hamilton in the early  sixties and branch lines leading to most of the collieries. At nights, if the 'Hamilton Advertiser' is to be believed, the streets of the town rang to the shouting, swearing and fighting of numbers of the newcomers and although trade and commerce prospered, especially the spirit trade, there must have been many older inhabitants who shared the 'Advertiser's' concern about what Hamilton was coming to. This was a traumatic period for the town, not least for the newcomers, uprooted, no sense of 'belonging', housed in conditions which were often cramped and dirty yet dependent on the boss for the house (long before the days of council housing), working or dependent upon someone working in dangerous and degrading work and with few sources of reassurance or consolation. Religion offered reassurance to a young Low Waters miner, J. Keir Hardie, in the form of the Order of Good Templars. But Hardie was exceptional especially among Protestant miners for the mining population was never known for its zealous support of the Church of Scotland. Drink offered an easier solace to many of the alienated, troubled people of the town. Sorry for the really loong quote, but I think it sets the context well. Shows how little has changed, are families in poverty in Hamilton the same ones that 4 generations ago arrived as these "newcomers"? The author seems to even in 1975 writing to have an undercurrent of retained prejudice of the division between newcomer and original Hamiltonian. Does anybody have any documentary evidence on the Keir Hardie myth? Does the name Good Templars imply there is an order of Evil ones out there?? The title of that book (& all the others this lady has 'written') should really be "Old Hamilton" by others & edited by Rhona Wilson. And don't assume everything written in a Stenlake book is accurate. My opnion only. There was no other markings at all on the row, took a wee walk up and down to look, not a jot. I spoke to some people who live there and they dont know anything about it. quite agree Captain B just flinging what scraps of info I have into the mix. The Stenlake stuff on Hamilton is pretty much verbatim what is in the 1575-1975 book anyway. I've also got a nice wee pamphlet from the 60s that was my grandpa's, signed by the author. I'll need to scan it in sometime. The contemporary Hamilton shop adverts on the sleeve are great. The carving could be from one of these? I don't know the area at all Im afraid, but would the building the carving is onbe near any of these ttwo Missions? Are the Missions still standing, maybe with a different use? ill have another wee walk round, using the map you posted if that allright crusty.